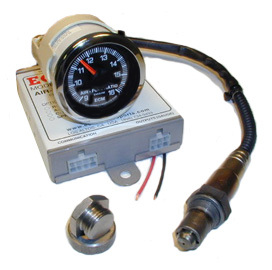 The G100-AC combines three important features into a single system: a wide-range AFR sensor, an easy-to-read gauge, and a linear 0 to 5 volt analog output. The 270-degree sweep gauge has a black or white backlit face, an illuminated pointer, and is highly visible in both daylight and night conditions. The analog output is suitable for input into a data acquisition system or engine controller.